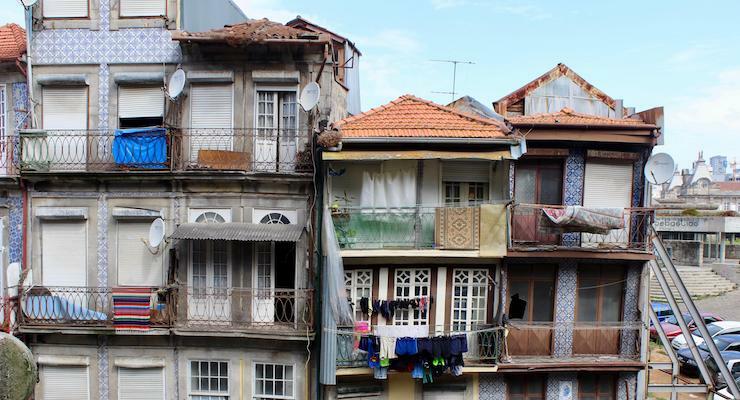 We spent a couple of of nights in the fascinating city of Porto on our summer trip to Portugal. I was travelling with my husband and our two children, 18 and 13 at the time. If you’d like to know about the rest of our Portugal trip, you can read my posts about Lisbon and about Praia D’el Rey Golf & Beach Resort. 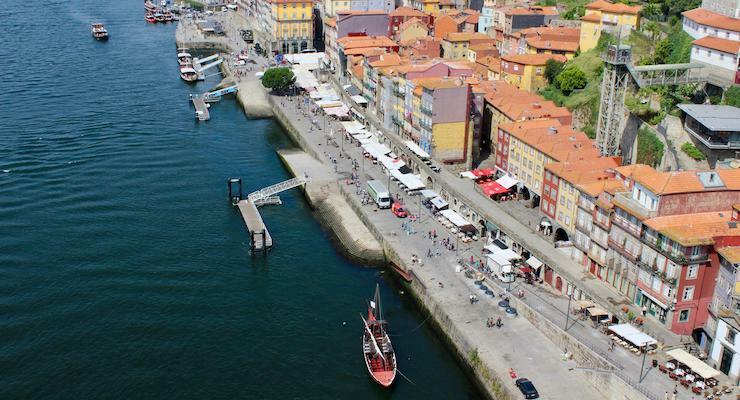 When we first arrived in Porto we headed for the historical Ribeira district by the river. 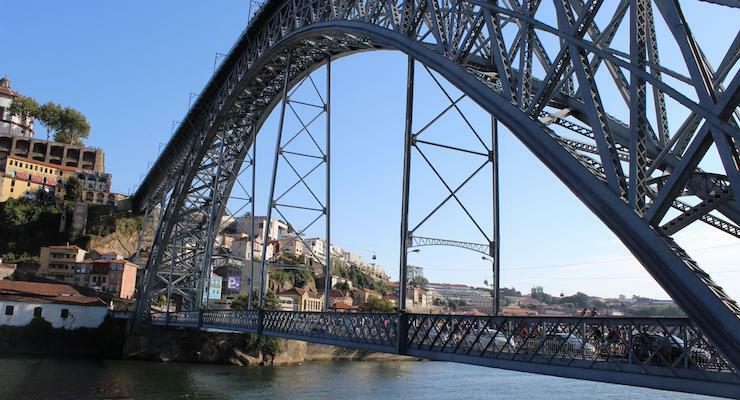 The area is full of pavement cafes and restaurants, and is dominated by Dom Luis I Bridge which spans the river from Porto to Vila Nova de Gaia. The bridge was designed by a student of Gustave Eiffel and has two decks: the lower deck is for cars and pedestrians, and the upper deck is for the metro and pedestrians (when a train passed close to us as we were walking across the top deck I admit to feeling a little anxious!). We were astonished to see some people diving into the river from the bridge – my 13 year-old son was transfixed by this sight, though I could hardly bear to watch. 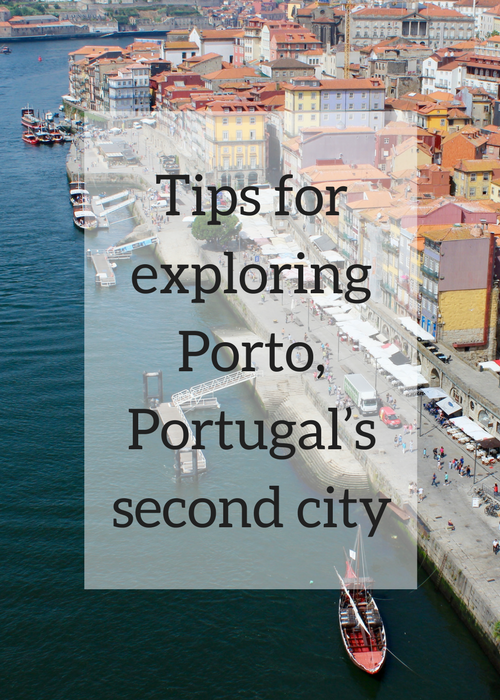 We walked across the bridge to Vila Nova de Gaia, home to a host of port wine lodges. Portugal’s leading port wine producers have lodges in Porto, and they offer public tours and tastings. We stopped for an evening drink on the terrace of the Sandeman port wine lodge, and then headed back across the bridge for dinner at one of the riverfront fish restaurants. 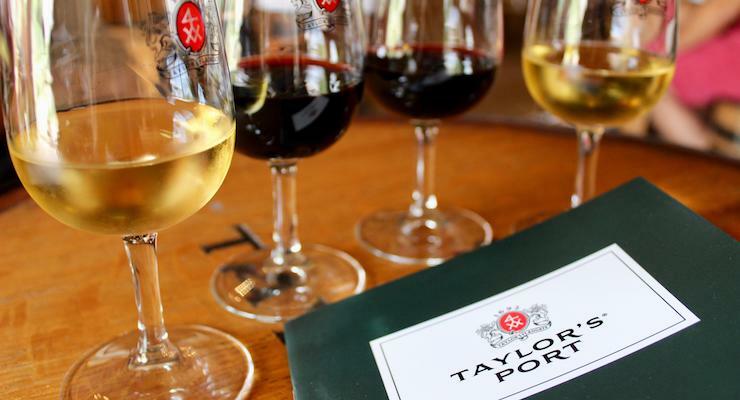 My husband and I went on a tour of Taylor’s Port Cellars one morning – the kids weren’t keen to do this and opted to relax at our hotel instead. It was very interesting to learn about the history of port and its influence on the region. At the end of the tour we were offered several different ports to taste. We then had lunch on the terrace of the lodge restaurant, which has a fantastic view of the city. Livraria Lello is a famous neo-Gothic bookshop which was frequented by J. K. Rowling when she was working as an English teacher in the city. Apparently the author worked on the first Harry Potter book here, and the bookshop’s unusual staircase inspired the one which she created for Hogwarts. We’re big Harry Potter fans, and I really wanted to go inside the shop, but when we arrived there we saw two long queues of people: one queue at the ticket booth (the shop is now so popular that you have to buy a ticket to go inside) and another at the shop door. So we just looked from the outside instead. 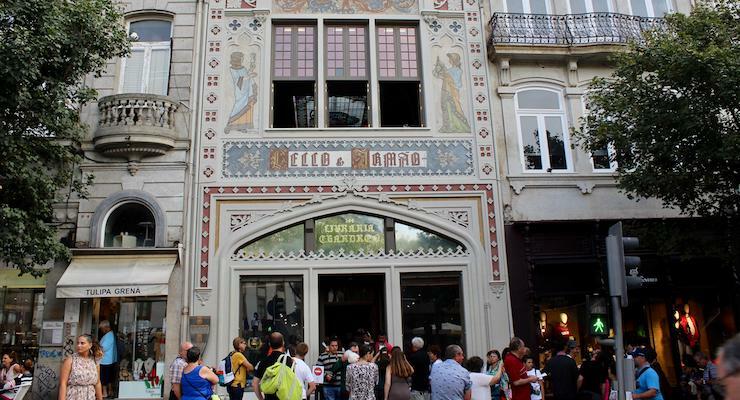 If I’m in Porto again I’ll find out what time the ticket booth opens and get there first thing, as I would like to go inside Livraria Lello. 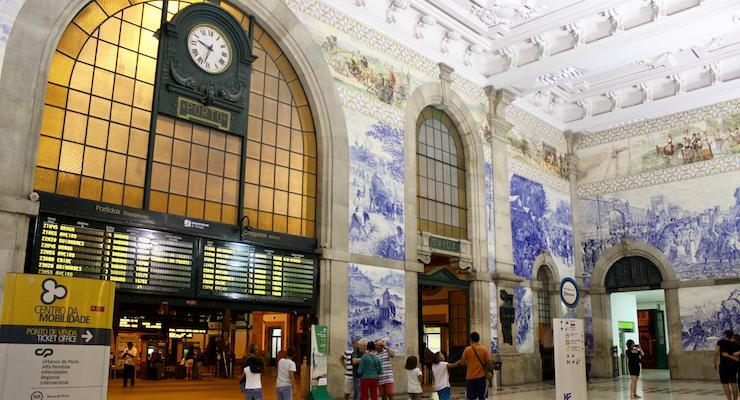 São Bento train station is a gorgeous Beaux Arts building which was constructed at the turn of the twentieth century. If you’re passing, pop inside to see the astonishing tiled interior. More than 20,000 tiles depict scenes from historic battles and the history of transport. We went in to have a look while strolling through the city one evening. We stayed at the Sheraton Porto Hotel & Spa, a modern five-star hotel in the city’s business district. We had two adjoining rooms and it was all very comfortable and relaxing, with everything that we needed for our stay. 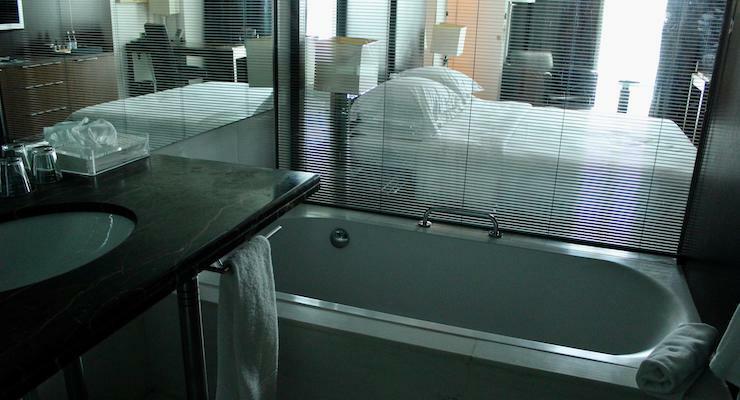 An unusual feature of the rooms is that the en-suite bathrooms have glass walls – with blinds, if you want to use them. We had breakfast at the hotel and ate there one evening, and the food was very good. As our hotel was on the outskirts of Porto, we travelled in to the city centre by metro. From there we explored the city on foot. The city is quite hilly, but we found it easy to walk around. We left our hire car in the hotel car park for the duration of our stay. I loved exploring Porto, and would like to go back there to see more of it. I liked the hotel, and would recommend it, but would prefer to stay somewhere in the city centre if I went to Porto again. Have you been to Porto? If so, what were the highlights of your trip? If not, is it the sort of place which you’d like to visit? Thanks I have bookmarked this for our forthcoming trip some handy tips! Did you need to book in advance for the port tasting? We’re going to head to the bookshop early useful to know! We just turned up and got in straight away, so I don’t think that you need to book. Looks a beautiful place to visit. The train station looks amazing! Thanks Nicola, I’ll have a look at that book. How long ago were you in Porto?